"…none have recorded Brahms' Piano Concerto 1 with the combination of skill and passion displayed by Englishman Clifford Curzon in this outing with George Szell and the London Symphony Orchestra. The music leaps from the grooves of this (mostly) well-made stereo recording, excelled by none other at putting across the sheer physical force of which Curzon was capable…The Speakers Corner LP reissue of the Decca original is superb: as good as this sort of thing gets". Stereophile Records To Die For – Art Dudley, Stereophile, February 2008. Concerto n° 1 For Piano and Orchestra - Sir Clifford Curzon and London Symphony Orchestra conducted by George Szell. With Curzon and Szell and the London Symphony Orchestra. This is a monumental performance of this Brahms masterpiece. 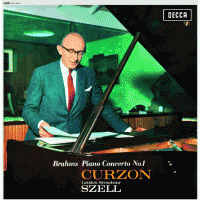 There is evidence that the session between Curzon and Szell was filled with verbal insults between soloist and conductor. However, their anger must have been channeled into the performances in the form of an electric energy. Listed as RM 20 by Robert Moon & Michael Gray.